Trust the people who know what they’ve built! In addition to the latest range of new boats, Linssen Yachts BV also offers a selection of pre-owned boats. Linssen Yachts offers two categories of pre-owned boats: brokerage boats and boats from the Linssen Collection. We offer brokerage boats for sale on behalf of the current owner. In this case, Linssen Yachts acts as the broker and is not the owner of the boat in question. However, these boats too are subjected to a thorough inspection and are subsequently entirely overhauled on behalf of the owner. Boats are delivered ex boatyard, including technical hand-over. 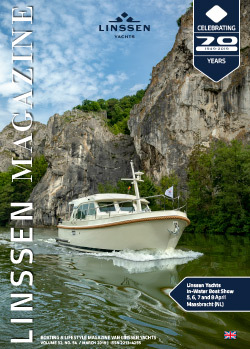 The Linssen Collection is a small, unique selection of recent, pre-owned Linssen boats. All boats with the Linssen Collection label are fully revised following a detailed technical and optical inspection and are offered with a one-year boatyard guarantee.